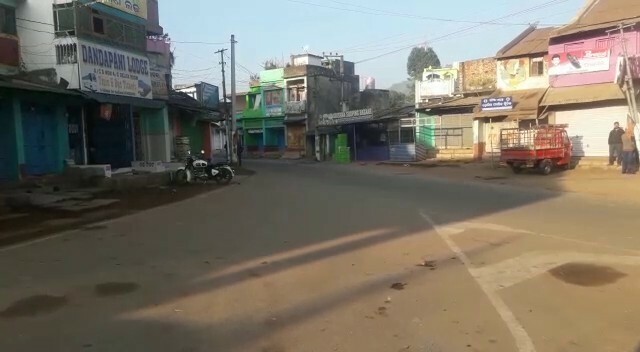 Bhubaneswar: Normal life has come to a standstill in Kandhamal district as a 12-hour is being observed jointly by the BJP and the Kandhamal Suraksha Abhiyan since this morning in protest against the incident of a Class VIII girl giving birth to baby girl in the Daringibadi Residential School a week back. Shops, bazaars, schools, colleges and Government offices have remained closed. Similarly, vehicular movement has been severely hit as agitators have blocked roads by burning tyres at different places. It may be noted a Class VIII student gave birth to a baby girl in the bathroom of her school hostel at Daringibadi on the night of January 12. While police have arrested the accused, the district administration has dismissed services of temporary staffs and suspended the school Headmistress for negligence. While the mother-girl is still undergoing treatment in a hospital, the baby girl has died, according to reports.